It is hard to believe that it's already been another year again, and it was a particularly exciting year too, with a lot happening with and around this blog. 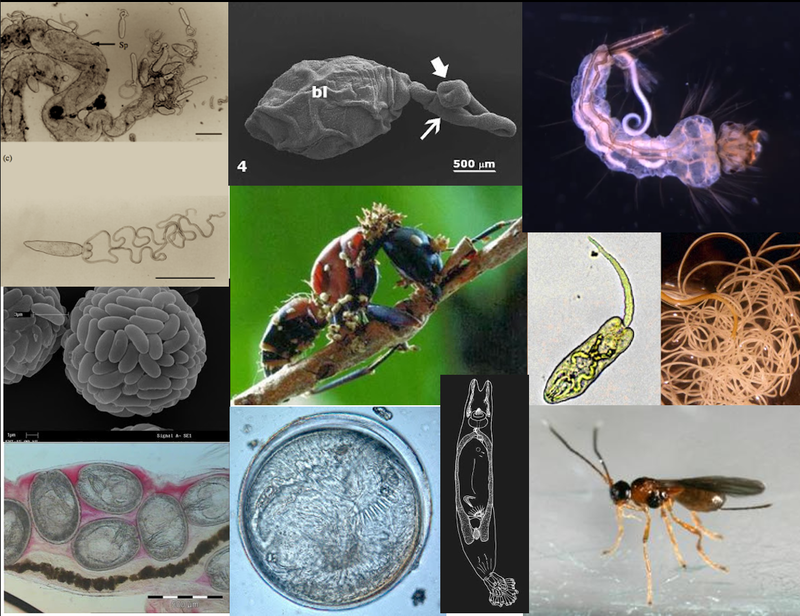 In terms of the parasites we featured on here, there were some which can be considered to be pretty extreme; like the only external parasite found on guppies that live in noxious tar pits, and some tapeworms with an special affinity for heavy metal. There are those that might make your squirm; like the sexually-transmitted roundworm in anole lizards, and a crustacean that lives in a fish's bladder. We gave seafood fans some food for thought with some parasites that plague catfish and flounder, and checked in on bunch of clam parasites (tapeworms and flukes) and mussel parasites too (Himasthla elongata). And while fish and shellfish might provide some fodder for parasites, on land, insects provide plenty more opportunities for parasitism, after all, insects are the most diverse group of animals on Earth and they make abundant hosts; from crickets to hornets to ants, and amongst these parasite of insects (some of which are insects themselves) there are some rather sinister ones - like the parasitoid wasp that takes its host to the edge of death so it can be a more compliant host, or the mosquito-killing round worms which sit like mines to be activated upon detecting the presence of its mosquito larva host. Of course, this year we also had some guest bloggers in the form of students from the University of New England ZOOL329/529 class of 2013 who wrote about how toxic birds makes for sad lice, self-medicating in bees, avian malaria parasites that make their host more attractive to mosquitoes, and how an intertidal fluke might respond to a rise in global temperature. Also, as with last year, we brought you some conference coverage too (part 1, part 2). We will be back next year with plenty more posts about the newest research in fields relating to parasitology which you might not have heard or read about elsewhere, and as usual, I have already lined up a few which I am going to be writing about... See you all next year! P.S. If you can't wait until next year, you can find some of my other parasite-related writing on The Conversation about freeze-tolerant parasites, a worm that usurp hornet queens, and fungi that plague the zombie ant fungus. And alongside writing this blog, I've doing a regular radio segment call "Creepy but Curious" where I sometimes talk about parasitic (among other things), like the zombie ants, the infamous crab-castrating Sacculina, the tongue-biter parasite, and the virus that melts caterpillars. While "many sucker-cups at the rear" sounds like the description for a Lovecraftian monstrosity, that is the name of a group of monogenean parasites called the Polyopisthocotylea. Let's just refer to them as "Poly-Opees" from this point to avoid that tongue-twister. They are ectoparasitic flatworms usually found on the gills of marine fish. Seeing as fish use their gills to extract oxygen from their aquatic environment, there is a constant flow of water washing over these parasites, which means these flatworms are essentially living in a high-flow environment. To secure themselves to the gill filaments, they have a sucker structure on their rear - this sucker anchors the worm in place, allowing it to flex the rest of its body and browse on gill tissue and blood. The rear suckers of monogeneans are not just a simple suction cup, but are composed of an array of intricate anchors, hooks, and clamps that vary considerably between different groups. In the case of the Poly-Opees, this sucker is armed with a series of clamps that gives that entire group its name. But today we are featuring a species that completely bucks that trend. Like most other Poly-Opees, it is also found on the gills of fish, but stands out due to the complete lack of clamps on its rear sucker. Lethacotyle vera is closely related to a monogenean that was originally described over sixty years ago. The first species described from the genus Lethacotyle was Lethacotyle fijiensis - which was described from a unspecified carangid fish from Fiji (note to fellow scientists - please take detailed notes! ), but there are only four specimens of this parasite in existence and only one of them is stored in a museum available for researchers to examine. A group of researchers revisiting this species' description noted the unusual absence of clamps on its rear sucker and decided to follow up the lead to look for this mysterious monogenean (or at least a related species - which was what they found). As L. fijiensis was originally described from a carangid fish (the group which include jacks, pompanos, trevally and scad), they decided that's where they should start looking. They obtained some Brassy trevally (Caranax papuensis) from some amateur fishermen and fish markets at New Caledonia and looked through the fish's gills for monogenean parasites. In was on the gills of those trevally that they came across the new species we are featuring today. They were able to confirm that monogeneans in the Lethacotyle genus do indeed lack clamps compeltely on their rear end. Poly-Opees vary in the number of clamps they have - some species have dozens of well-developed clamps while others have clamps that are rather small and may even be considered as vestigial. In the case of Lethocotyle, they are completely gone. But if they have no clamps, how do they hang on? They have four tiny hooks on their rear, but they are so small that they probably contribute little to securing the worm in place. The researchers noted that instead, the rear sucker has turned into a flap covered in "tegumental striations" in the place of clamps. These are microscopic wrinkles that increase friction and provide traction against a substrate - these microscopic structures might be somewhat comparable to those found on the foot pads of some insects. In this case, it provides enough traction to keep L. vera securely fastened to the gills of its host. What the story of the Lethocotyle genus and their rear suckers shows us is that parasites are far from being "simplified" evolutionary dead ends, but that they continue to evolve new structures even as they shed others. As with free-living species, certain features often become lost or vestigial over the course of evolution, but then new structures evolve in their place. Lethacotyle might have lost its clamps, but it has also gained a new attachment feature (striation-covered flap) that makes it unique among all the known monogeneans. Justine, J. L., Rahmouni, C., Gey, D., Schoelinck, C., & Hoberg, E. P. (2013). The Monogenean Which Lost Its Clamps. PloS one, 8(11): e79155.